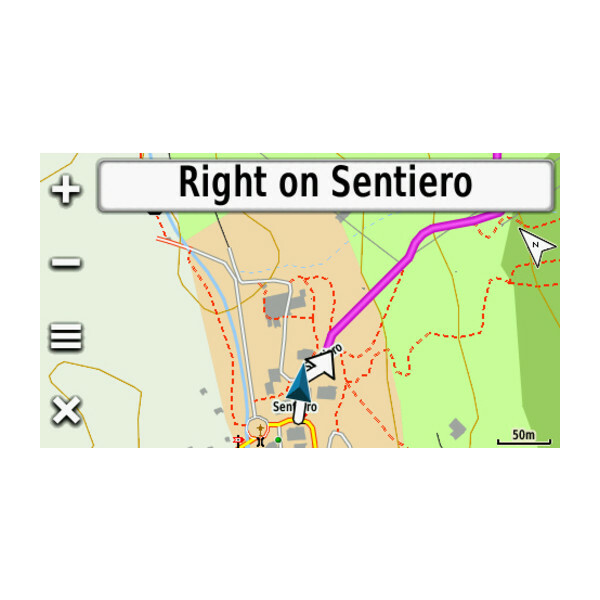 Upgrade your compatible device with highly-detailed recreational maps of Italy. From the the Alps summits down to the Sicilian beaches, this topographic map — in a reference scale of up to 1:5,000¹ — contains versatile route planning for hiking and climbing. Now with extended detailed coverage in southern Italy and Sardinia. Offers the largest recreational trail network for Italy, including the official trails supplied by the Italian Alpine Club (CAI), Regional Tourist Offices, National and Regional Parks, with an extension of approximately 200,000 km. 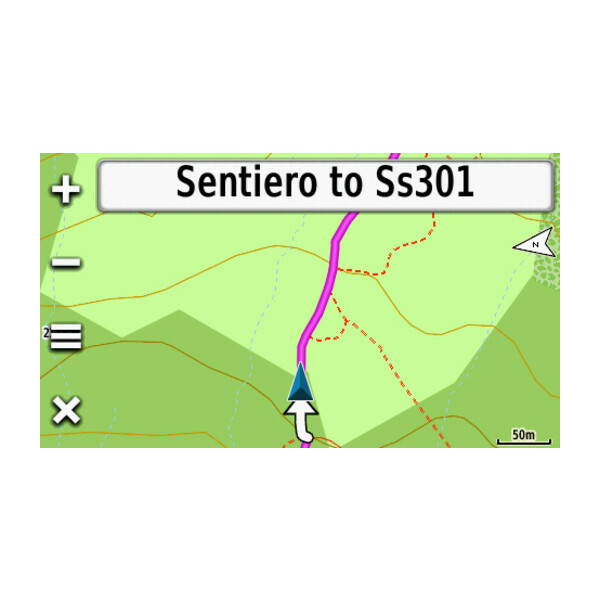 Includes ActiveRouting², which allows you to customize and specifically plan routes for the entire road and trail network. 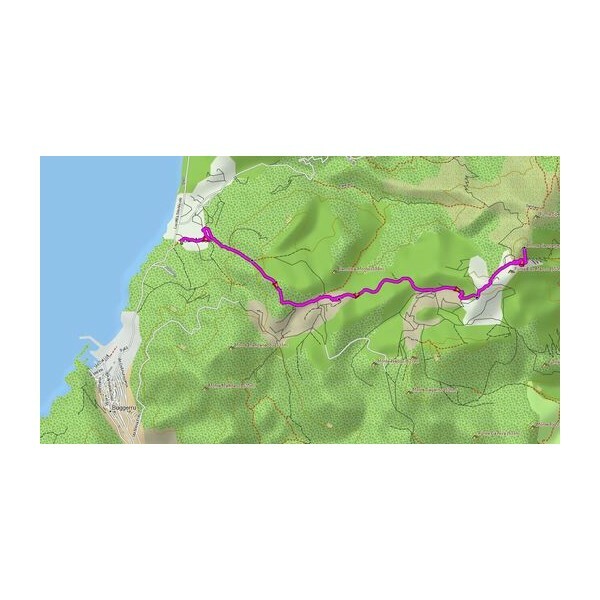 The activity specific map displays highlights of suggested routes in addition to dedicated biking and hiking routes. Includes searchable addresses with street numbers nationwide. Features Digital Elevation Model (DEM) with height contours with a 20 m interval. 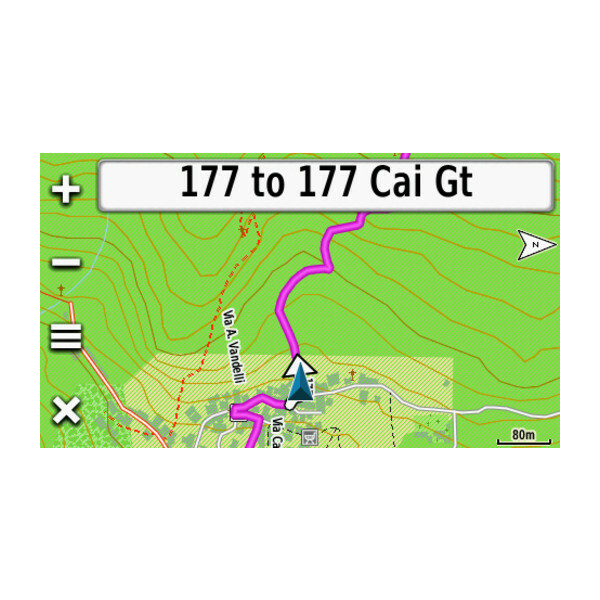 Compatible with our free BaseCamp™ software that lets you plan trips on your computer and transfer routes and waypoints to your compatible device. 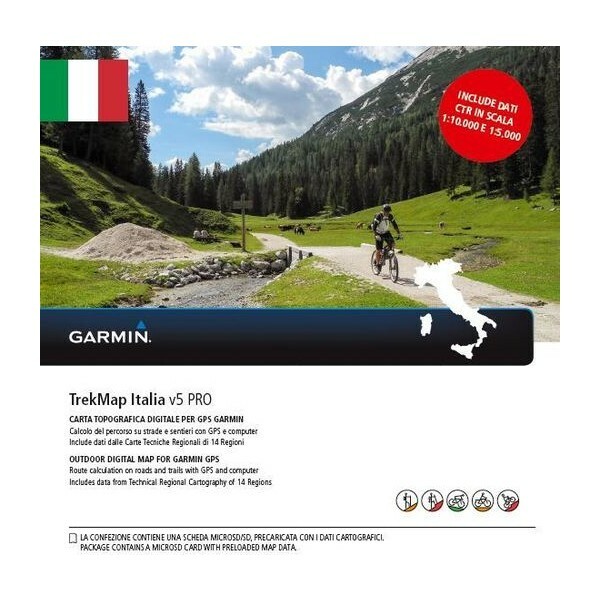 ¹Topographic maps in 1:5,000 and 1:10,000 scale available for these regions: Lombardia, Piemonte, Liguria, Provincia Autonoma di Trento, Veneto, Provincia Autonoma di Bolzano, Friuli Venezia Giulia, Emilia-Romagna, Toscana, Sardegna, Umbria, Lazio, Calabria, Basilicata, Puglia. The remaining regions are covered with standard 1:25,000 topographic maps. ²ActiveRouting functionalities supported by Montana®, Monterra®, Edge® 810/1000, GPSMAP® 62/64 and Oregon® 6xx/x50 Series. 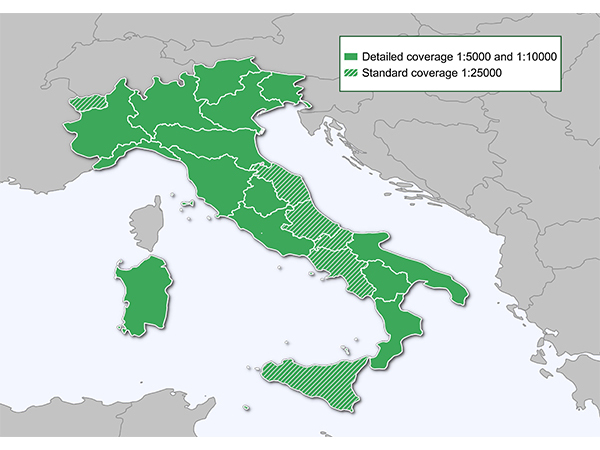 Features coverage for all of Italy. SOLID GREEN geographic area is covered with data in 1:5,000 and 1:10,000 scale supplied by the following Regional Cartography Offices. It includes: Regione Lombardia, Regione Piemonte, Regione Liguria, Provincia Autonoma di Trento, Regione Veneto, Provincia Autonoma di Bolzano, Regione Friuli Venezia Giulia, Regione Emilia-Romagna, Regione Toscana, Regione Sardegna, Regione Umbria, Regione Lazio, Regione Calabria, Regione Basilicata and Regione Puglia. DASHED GREEN geographic area is covered with standard 1:25,000 topography detail.